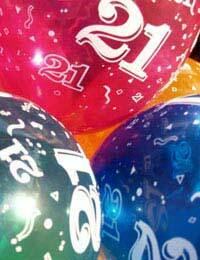 Making a speech at your 21st birthday party is a great way to thank your family for their of support and to highlight your plans for the future. No one was ever criticised for making a speech that was too short, and just before a party is set to get started is the perfect example. There will probably be a real cross section of ages and characters there. This means that the content of your speech needs to be suited to your audience – those bawdy tales you may like to remember with your university friends are very different to the tales of nativity plays that your grandparents will want to hear. The best advice is to keep it clean, positive and short. It is a good idea to plan your speech well in advance because on the run up to the day itself you will have all manner of things to think of. You will already be the man/woman of the moment and you will only be speaking in front of people that want the best for you, so any nerves can be allayed by remembering the happy faces you will be addressing. It is important to remember when in the evening you are going to make your speech. If you are having a sit-down meal, try to have your speeches before you eat (and before the food is served) so that you can enjoy your meal. This will also help guide the timing of the speech and will keep it fresh. If you are not having a sit-down meal, the best advice is to make sure your and any other speeches are over well before any volume of alcohol is consumed as this is the worst enemy of a good speech, both for you and the audience. Start your speech by thanking your guests for coming. You can talk about the theme of the evening, if appropriate. Example: Thank you all so much for coming to help me celebrate my 21st birthday, I really appreciate that you’ve all travelled to be here – especially auntie Joan and uncle Graham who have come all the way from Edinburgh! I would like to a say a massive thank you to my mum, dad and sister for arranging this party – I’ve been looking forward to it for ages and I can’t believe it’s finally here. Mum said that I wouldn’t want to celebrate my birthdays when I was her age, so I’m going to make the most of this party! The food all looks delicious and I know my mum and grandma have gone to a lot of effort to make it and Marks and Spencer’s have excelled themselves on the cake!! This depends on the variety of people present, your current circumstances and what you are planning to do next. Many people will be at university when they are 21, so this is a good time to share some of your university life with your family – just none of the more racy stuff! You can thank your family for being supportive and say that you are pleased some of your university friends are at your party. If you do not want to talk too much about your personal circumstances – perhaps you are finding it hard to find full time employment – a good idea is to talk about ‘on this day in history’ type events that are entertaining but not quite so personal. Example: I am hoping that this will be the year that all my efforts at school and university will start to pay off. I have applied for some excellent and not so excellent jobs and aim to be in my own grotty flat before the year is out! Most of all, I am hoping that this party does not end up like my brother’s 18th – shopping trolley dodgems is not amusing, is it mum?! This is really a long enough speech as everyone will be looking forward to the party. All that is left to do is wish everyone a good time! Example: Thanks again to everyone for coming and the great presents that you’ve given me - I really appreciate it. On that note, I think mum will agree that it’s time to get cracking on the potent punch! This is a great examples and m starting to get an idea of what to say in my 21st birthday party after I read this helpful birthday speech.. so thanks !! Its marvelous what my Lord Jesus Christ has taught me through your works. Though my assignment brought me here, I've gotten more than just a reply for my lecturers. Simply because, I had a very nice time (tutorial) with this website. Thanks God, thank you all, God bless you the more.